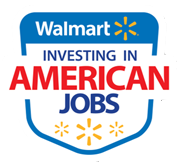 As a potential supplier, one of the most important things you can do is get to know how Walmart works. Whether you are a new supplier servicing our stores or you have known us for years, here are a few ways to understand how we help our customers and members save money and live better - while consistently maintaining our commitment to quality and everyday low prices. How do you qualify to apply? Please Note: US manufacturing is one of many factors customers consider when making a buying decision. In addition to your manufacturing location, your focus should be on details unique to your products or company that will create a compelling business case for our buyers to make an educated decision based on facts. If you're offering Books, Video, Audio, Magazines or Newspapers, these categories will not be part of the product meetings. Please contact these companies directly. Walmart does not pursue self-published books. *Please note that the process to apply for consideration to become a supplier may require you to expend a significant amount of effort and resources. Completing the application process does not guarantee that you will be approved to be a supplier. Further, if you are approved, Walmart and Sam's Club don't guarantee the level of success or business that you may or may not receive. Becoming an approved supplier simply means that you are eligible to receive orders or business from Walmart or Sam's Club. Any efforts or expenditures you make to become or remain an approved supplier are entirely at your own risk and will not be reimbursed.